My goal is to partner with local leadership to see families reached and believers equipped to fulfill the vision and mission for their local congregation and region. My ministry emphasis includes equipping and encouraging children's ministries leaders and parents, and providing exciting and entertaining biblical instruction and outreach to children. Key topics I emphasize are God's Kingdom, Our Identity in Christ, God's Design for our lives, Salvation, and Expectation. Born and raised in central Illinois, I enjoyed a great childhood in the middle of farm country USA. Most of this childhood was spent attending Minier First Assembly of God in Minier, Illinois. It was there I accepted Jesus as Lord and Savior at an early age. It was also there that I received a great deal of discipleship and many encounters with God. It was while attending Jr. College that I got involved serving in Minier A. G.'s youth group and soon found God leading me toward Bible College. At first I thought my call was to youth, but would soon find myself surprised by God. In the fall of 1992 I began attending North Central Bible College and for the first time encountered the idea of being a Children's Pastor. 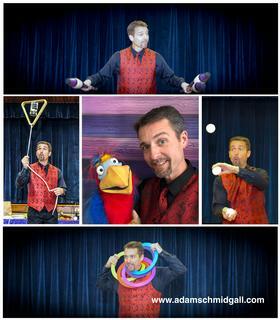 This idea was new to me, and although I juggled, unicycled and enjoyed illusions, I had no desire to pursue children's ministries. As I struggled through my first year at Bible College, over and over again, God pointed me toward specializing in children's ministries. At first he pointed, then he began to shout. It became all too clear to me that children's ministries was the ministry I should pursue. Once I committed to this direction, doors began to fly open for me and my skills began to grow. After graduation I joined the staff of Church on the Terrace (later named God's Place) in Ogden, UT. For 16 years (1996-2012) I served there as Children's Pastor. During that time, I served as Children's Ministries Representative for Utah, Sectional Committeeman for Northern Utah, and Directed our Kid's Camp for many years. We also started an annual event which continues to this day. After being in Utah for 13 years, God blessed me with my beautiful wife Joni. We currently have 4 children (2 boys and 2 girls). We now live in Layton, Utah and love to travel when the opportunity affords. When not spending time with family of the people of our church, we enjoy hiking and camping. Currently I am a full-time evangelist available for travel throughout the year. It is my goal to be a resource to churches throughout the United States and Internationally, with an emphasis on equipping our western states. 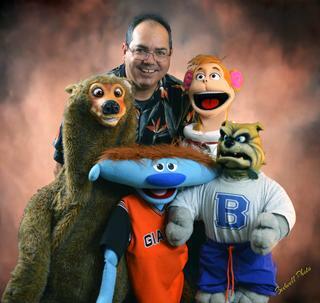 It is my pleasure to provide sound and powerful teaching as I use my talents in juggling, illusions, ventriloquism and other illustrative methods. Although my specialty is with children, please also consider me in addressing your youth as well as adults in your congregation. I love speaking to all ages and also passing on a vision for reaching children. If the role of an Evangelist, as well as the Apostle, Prophets, Pastors, and Teachers is to equip the body of Christ for works of service, then I believe we all must be strategic in what concepts we are choosing to communicate as we equip believers. As I consider what the church should look like as we grow into the future, I see a multi-generational church that is deliberate about community and passing on a legacy to the generations that will come after us. The legacy of a church that knows their God and who they are in Christ. A church that has learned to "Be" and any acts of service it provides are actions of obedience to God and acts that come from the heart. A church that understands what it means to live in and possess the Kingdom of God. A church that pursues their destiny in Christ and encourages others to do the same. A body of believers who know God's voice and expects God to lead them in love and service. A church that has appropriated the fullness of the salvation that Jesus provided for them on the cross. The role of an evangelist to me is to partner with local leadership in encouraging and challenging believers to grow in their relationship with Christ and their current understanding of key concepts of the Kingdom. Jesus said, "You will know the truth and the truth will set you free." Free people enjoy freedom. This is essential for bringing revival. By sharing the truth in fun and exciting ways, and allowing God to confirm his message in signs and wonder, I believe we can equip believers to walk in the freedom God has for them. If truth sets free, then conversely, lies bind and even enslave. The lies of the enemy are often subtle and overlooked. That is why I believe my role is to help people look deeper at what it means to make Jesus King and Lord. To discover who we are in Christ and understand who God is, while identifying the misconceptions from which many of us operate. For me the idea of helping people enjoy their freedom in Christ is not about behavior or what is permissible or not. It is more about knowing the truth and from this base, more fully enjoying their relationship with Christ; and from this enjoyment, being empowered to grow in the fruits of the Spirit as they walk in partnership and obedience with the Holy Spirit. Revival then looks like the Church ceasing to "try" to walk in obedience, but instead actually being transformed because the minds of believers have been renewed by the truth and set free from the twisted half truths of the enemy. My role then as a Children's and Family Evangelist takes on a new definition for me. Part of my role is to introduce children to Jesus. To lead them in making a solid choice to surrender to Jesus as King and Lord. But, it is also, and I believe more so, to lay a solid foundation of growth for them, and to equip parents in equipping their children to avoid the lies and pitfalls our generations have been blinded by, so that their generation can walk in freedom for their entire lives. This means letting them know from the earliest age who God is and who He calls them in His Word, encouraging them to seek the Kingdom first and consistently communicating what this means, to instill in them the belief that God has an incredible plan for their lives and to equip them to communicate with God daily. And to make sure they know God wants more for them than to simply be "saved" so they can go to heaven, but that he wants them to be saved, healed, and delivered from all the works of the enemy so they can enjoy and share His Kingdom here on earth in this life, everyday, before enjoying heaven in the afterlife. I believe as all of us, regardless of calling, work together toward equipping the next generations with these values, that we will see revival come. Not revival of people trying to be something different, but one where the Church is different because it's members have been transformed by the renewing of their minds and are increasingly living up to what the Church is called, The Body of Christ.